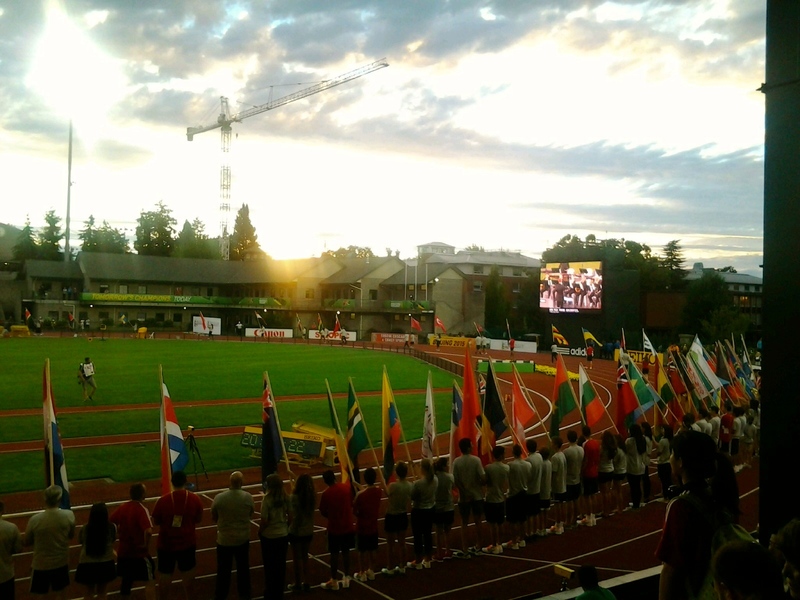 One week deep into sleep deprivation and already enamored with the international athletes and officials that had taken over the University of Oregon campus, I sat with the visiting teams to watch a perfect race unfold: the junior men’s 10,000 meter final. And as the setting mid-July sun dramatized the sky and a symphonic melody filled the Hayward Field air, I danced with the Kenyans. Let me explain. For two weeks, I spent virtually all of my waking hours at the IAAF World Junior Championships, but I only actually saw about four events. I worked in the Athlete Village, interacting with international people constantly in one of the coolest experiences of my young life. My co-workers and I were anchored to our welcome desk, but on the day of the Opening Ceremonies, we managed to briefly escape. Armed with our signature dorm food salads, we entered the stadium just as the music started and people circled the track with every participating country’s flag. Since we lived behind that desk, we were buried in our own World Juniors experience, but had not witnessed any of the big-picture effects until then. We sat in the athlete’s seating area and listened as each team would cheer upon their flag’s announcement. To our left, Brazil hollered and below us, Canada hurrahed. Midway through, it became apparent that we were sandwiched between the Kenyans when their flag’s entrance incited cheers all around us. Excuse the crappy non-smart phone picture. Around us, the Kenyans brazenly cheered for their athletes with each passing lap. While their runners did not set the initial pace, they took off with a third of the race to go. A Ugandan latched on with the two Kenyans, and all three took the lead as if the 17 laps prior had been a convenient warm-up. Their pace quickened and they picked off runners a lap behind like it was part of a childhood game. I have become accustomed to the African style of dominating distance races, but watching it unfold with athletes my own age on the stage I have frequented my entire life left me breathless. The Kenyan excitement grew in sync with the leaders’ increasing gap. Athletes and team officials rose to their feet and my co-worker and I were moved to do the same. With three laps to go, the Kenyans overtook the Ugandan. The cheers around us amplified and the team’s involvement with the race became a full-body endeavor. Several people sprinted to the front row and leaned over the barrier while others fell to their knees and praised some higher power. With two laps to go, the Kenyans maintained the lead over the Ugandan. Those who remained standing began to dance and sing unabashedly. Their pure, unfiltered joy was so electrifying that I joined them in their dance and yelled, “I AM KENYA!” which in hindsight doesn’t make much sense, but in that moment felt like absolute magic. I cheered for the Kenyans in those last few laps like I would if an American runner was on his way to Olympic gold right in front of me. But the race only intensified and the Ugandan somehow out-sprinted both Kenyans, leaving the runners with the lesser two medals and the team with complete devastation. The last 100 meters silenced all songs and halted all dances. While the elation I had absorbed moments earlier still remained, I watched dozens of people go from euphoria to anguish, and my heart broke with all of theirs. 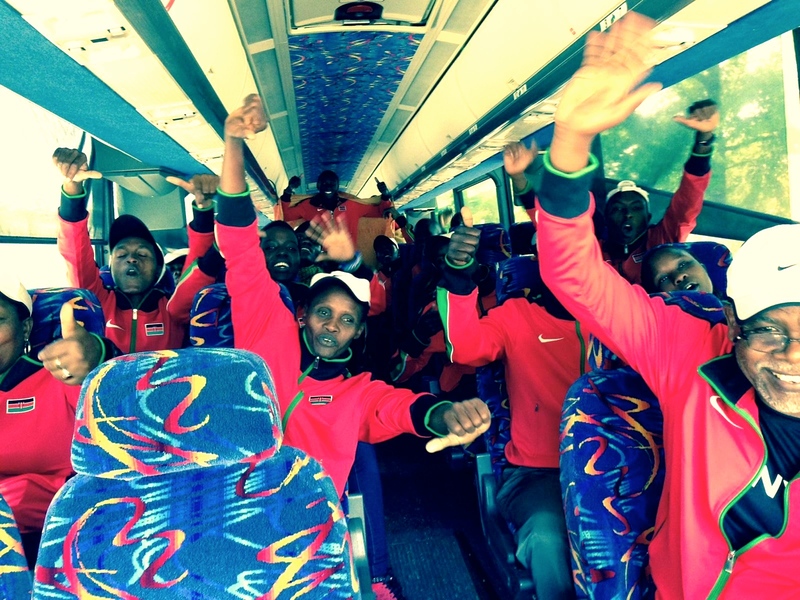 The Kenyans arriving in Eugene. Imagine their smiles during the race. Photo courtesy of Marcia. Still, those few minutes of joy I shared with the Kenyans lifted me to a state of communal ecstasy that I have not experienced since an ODESZA concert earlier this year. This enchanted atmosphere only exists when a crowd of people simultaneously abandon all qualms and accept the present so completely that the past and future seem irrelevant at best. It’s the kind of feeling that Beatles songs promise will definitely come with LSD use and probably come with world peace. In short, it was bliss. I spent over 200 hours at the World Juniors, but dancing with the Kenyans was my favorite moment because it was a moment of paradise. I learned so much from all the federations I interacted with, but no lesson so profound as what it means to believe in something with every atom of your being. While I also learned what it feels like to watch dreams perish, the physical outcome still seems secondary to the anticipation that precedes it. After all, the Kenyans came back to win the 1500, so I can only begin to imagine the exhilaration that filled the stands in those precious moments.